Shilpa Rumjeet has dedicated her work to the study of wastewater biorefineries. Along with a team of postgraduate students and scientific experts she is coordinating a governmental research project, which is funded by the Water Research Commission. Valorisation of wastewater from the pulp and paper industry is one of her main goals. Natural resources are depleting and water as a limited resource needs sustainable management. Wastewater biorefineries (WWBRs) offer the dual possibility of treating wastewater, while using the nutrients contained within (e.g. carbon, nitrogen, phosphorus) as resources to make bioproducts. The distinguishing feature of this biorefinery is that clean or ‘fit for purpose’ water is seen as an additional product. Due to the characteristic dilute and unsterile nature of wastewater, WWBRs require the integration of multiple unit operations to ensure both compliant water and bioproducts production. To make WWBRs a profitable venture, production of high value products must be targeted with any residual organics being converted to low value energy products. In order to enable this development, engineering processes need to be combined with biotechnological advances to enhance productivity of bioproducts along different bioreactors. Complex and high volume industrial wastewaters were identified as suitable streams to investigate this type of refinery. Shilpa is investigating the potential of resource recovery and value addition from wastewater streams in the pulp and paper industry. Together with her team, she is working towards the successful implementation of a pulp and paper wastewater biorefinery in South Africa. Pulp and paper mills have been grouped into geographic clusters to identify collaborative opportunities. Focus is given on the proper characterisation of the wastewater streams to identify the resources contained within. A product portfolio, targeting high added value products, is being put together to ensure economic viability. This study is further supported by process flow diagrams and flowsheets which are being compiled for selected products. The material and energy inventories will additionally inform on the economic and environmental implications of the proposed biorefinery. Shilpa’s main objective is to design an implementation framework which can be transferable to other industries, who wish to valorise their wastewater. Her core research interest is the circular bio-economy where petroleum derivatives are substituted by their bio-based counterparts and waste is treated as a resource. Sustainability and the preservation of nature are important aspects in her research. 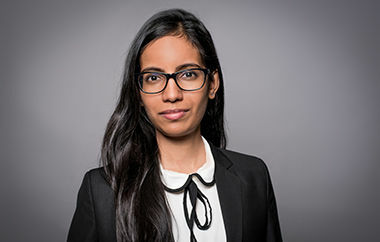 The jury appreciated Shilpa’s research approach, which links closely to the United Nations Sustainable Development Goals of providing clean water and sanitation as well as harnessing clean and affordable energy. Moreover, her pulp and paper wastewater refinery focus offers a possibility to exploit the potential of lignocellulosic waste. The jury believes that her research will bring valuable insights for further studies in wastewater biorefineries. 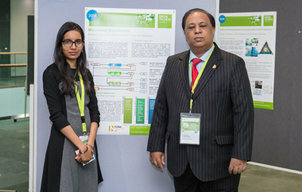 Shilpa Rumjeet, Green Talent 2018 from Mauritius, shares her personal experiences during the Science Forum 2018 in this article. 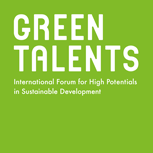 more: Experiences as a 2018 Green Talent by Shilpa Rumjeet.